Starting a new Midwifery Practice Group (MPG) is a significant undertaking and a major time investment. There are countless financial, business, community and professional issues to consider before starting the process. While it is almost always midwives who initiate the process, it is also possible for community members to do the work of setting up a midwifery clinic. You can always contact the AOM policy department to access individualized guidance and support; you may also want to seek outside accounting/financial assistance with respect to the budgeting process. Midwifery is managed by the Ontario Midwifery Program (OMP) of the Ministry of Health and Long-Term Care. It is the job of the OMP to ensure that access to midwifery services is distributed as equitably across the province as possible. For this reason, midwives who want to open new clinics must go through the process set up by the OMP. Click here for a slide deck developed by the OMP about the approvals process. Developing a successful proposal for a new MPG is an involved, complex and time-consuming process. A new practice proposal that considers the particular needs of the community, business practice issues and demonstrates strategic thinking and time investment is more likely to receive approval. The first step in developing your proposed MPG is to contact your local Transfer Payment Agency (TPA) and ask for a new practice group proposal package. The proposal package includes detailed submission guidelines and a budget submission spreadsheet. If you are unsure of who the local TPA is, please contact the policy department at the AOM. You may request the new proposal package from the TPA at any time during the year, but the deadline for submitting to the TPA is always the end of September. 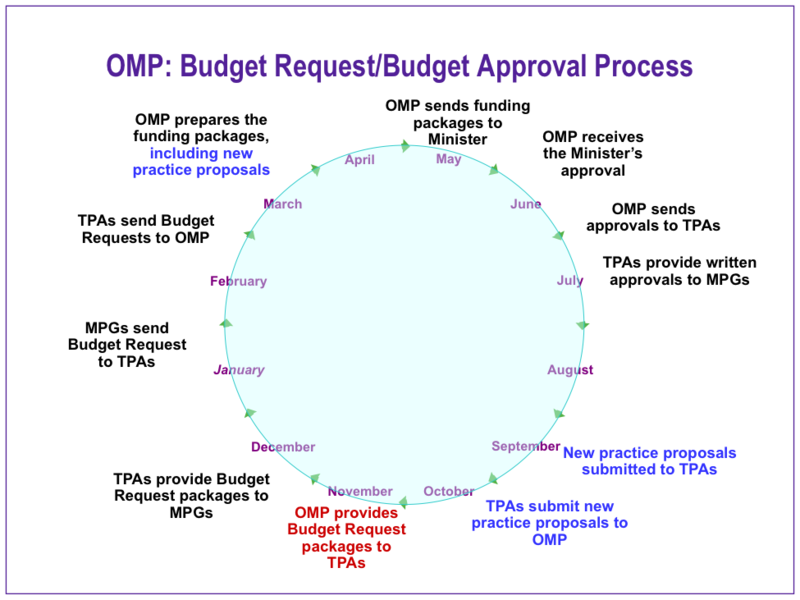 The TPA then reviews the practice proposals that have been submitted and makes recommendations to the OMP, who makes the final decision. Approval announcements for new clinics normally occurs the summer/fall after the proposal was submitted. Once approval has occurred, new practice groups sign the Funding Agreement contract with their TPA. Midwives can then access sources of funding that support start-up costs, including some clinic renovations and time spent securing hospital privileges. Perhaps the biggest requirement of your new practice proposal is demonstrating the community need for a new practice group in your proposed catchment area. This is partly geographic (is there an area where families cannot access midwifery care?) and partly based on client populations (is there a particular population you intend to serve that is currently not being well served?). BORN Provincial reports; your own data; custom reports on care providers, breastfeeding rates, etc. Use this form when making a data request. Another major consideration is determining the size of your proposed practice group (which itself will be largely dictated by how many clients can be served annually) and how you anticipate the practice will grow. It is important to note that the College of Midwives of Ontario (CMO) requires New Registrants (NRs) to complete their NR year in an established practice, not a newly formed one. While having hospital privileges [hyperlink to page on getting hospital privileges] is not a requirement for the OMP to approve a new MPG, a commitment to securing privileges in the future is important. Use Find a Midwife to determine which hospital(s) serve(s) your proposed catchment area and whether or not they currently offer midwifery services. In many cases, hospitals place caps on the number of midwives privileges or the number of births they may attend. This is currently one of the biggest barriers to the growth of the number of midwifery practice groups in the province. If you can, contact the head midwife at the hospital to discuss the local situation. If a hospital does not offer midwifery services, try to determine if it has ever offered privileges to midwives in the past. If it has, it will be helpful to explore the history of how midwifery was received and the reasons why service discontinued. In either case, if advocacy support is needed, contact the AOM policy department or check out our hospital integration page. It is important to determine who your TPA will be and start developing a positive relationship with those within the TPA who are responsible for midwifery initiatives. TPAs are incorporated, local primary health organizations with a community board, whose size and structure vary a great deal depending on where they are located. (Click here for a detailed description of the TPA and its relationship with the OMP and MPGs). The practice proposal submission requires a definition of the proposed area in relation to road boundaries. When deciding on the proposed catchment area, consider include travel, overlap of services, population and hospitals serving the area. If your proposed catchment area is outside of an urban setting, contact the AOM to discuss whether your practice could qualify as remote or rural; particular provisions are made in the Funding Agreement to support MPGs in those places. It is important to identify who the important stakeholders in the community are, and to begin nurturing relationships with them. These include people or organizations that have the potential to contribute in a positive way to the success of a MPG proposal, as well as the ongoing viability of the midwifery practice. If you intend to serve particular client populations in the community, it will help your case to include data and a letter of support from other organizations who serve the same clientele. When meeting with potential community partners to determine the kind of support and connections that exist in the area, consider asking if they would be willing to provide a letter of support for your proposal. Ontario is divided into 14 LHINs that are tasked with streamlining regional health care planning. While MPGs are not directly within the purview of the LHIN, hospitals and other community health services are. In some areas of the province, LHINs are developing community maternal newborn service plans that could affect planning of new practice groups. As such, LHINs may be an important potential source of support for the new MPG and its members. Midwives should be aware of their LHIN's involvement with maternity health services. The AOM has developed resources that midwives can use to educate representatives of their local LHIN about midwifery services.